The S2 is an articulated fly pattern that I have been playing with for quite a while now. I wanted to tie up a pattern that had a lot of movement but also one that lacked the bulk that some of the flies in my boxes have. There are elements that I have taken from other streamers as well as a few elements from the classic salmon flies that I have been playing with as of late. I had Bull Trout in mind when I was developing this fly pattern. I don’t think it’s really a secret anymore but Bull Trout LOVE the colour white. 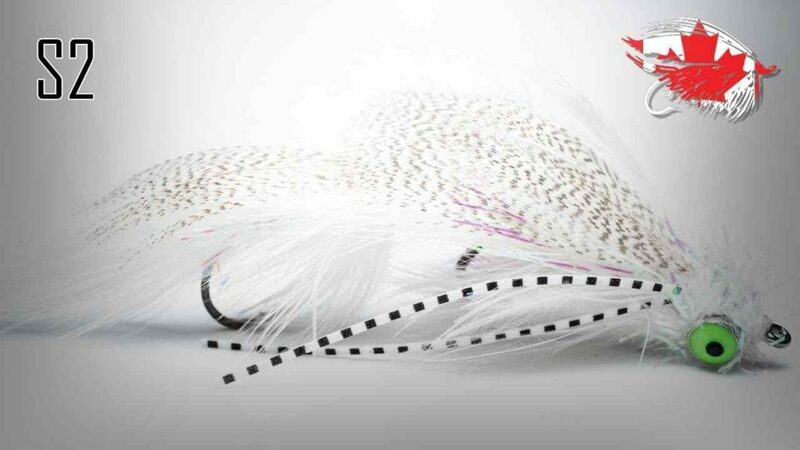 I am also tying this fly pattern in Olive’s and Yellow’s to match the sculpins in my local rivers. The S2 is an easy fly to tie and it is a great way to introduce yourself to the world of articulated streamers. Here in British Columbia, in our rivers and streams, all of our flies and lures must have single barbless hooks on them. On this fly I will cut off the rear hook for most of my S2’s. I do this because I find that Bull Trout and other predatory fish will attack the head of their prey first. For the times that the fish are a bit hesitant, and short striking the fly, I will have a few of these with the front hook clipped off. Articulation: Senyo’s Intruder Wire Red, 2 red plastic seed beads, 1/8” White Brass Bead. Head: Superfly Large Pearl Crystal Chenille, Solarez Bone Dry.